If you need an all-in-one software utility to search, find, record, download, convert and enjoy music, movies, videos, podcasts or radio stations from the Internet or DVD discs, Audials One is one excellent choice. Audials One is developed by RapidSolution Software AG, who is also the developers for the popular Radiotracker, Tunebite and Mediaraptor. Audials One virtually combines all features of these programs, and more to provide entertainment from any source, and on every device. With Audials One, users can download media, including live streaming or on-demand music and video, for free, which also readily available in the preferred file format. 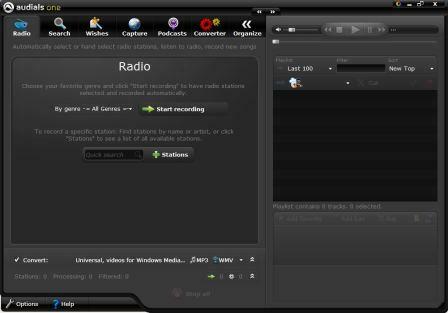 The new version of Audials One 8, released on November 2010, offers an improved user interface and better features for enjoying music, videos, movies and podcasts. Find and download unlimited MP3 music from Internet radio stations or websites – completely free, ultra-fast, totally legal and supports streaming services like Last.fm or music portals like Grooveshark with Audials as audio stream recorder. Podcatching with built-in podcast client and integrated, automatically self-updating directory of audio and video podcasts. Download and recording protected films and unprotected videos with Audials as video recorder and Internet film downloader. Audials One built-in universal converter supports every file format required by today’s PCs, mobile phones, iPods and other mobile devices. Able to bypass DRM copy protection imposed by music providers, such as songs from music subscriptions. Able to crack DRM copy protection on videos or legally re-recording and make copies of DVDs. Automatically populating ID3 tags, cover artwork and lyrics. Built-in Audials Media Player supports music, videos, podcasts, films and playlists. Supports installation onto portable USB flash drive. Audials TV provides live streaming TV stations. My Digital Life is giving away three (3) free license keys to activate and unlock Audials One version 8 as full version products, sponsored by the developer. The retail price of each license of AudialsOne is $59.90 (aff). Note that Audials One may be considered to be infringing copyright, though it claims that for personal use it’s completely legal. If you have legal consent, do not enter into the giveaway contest. To win a registration key code of Audials One, just write and post a comment below. A valid email address must be entered on the “Mail” field. Do not post email address inside comments to avoid spam. All comments must be posted on or before 23:59 PM on December 15, 2010, according to comment posted time (UTC+8). You can post as many comments as you like to increase your chance of winning. Three (3) winners will be selected randomly, with each entitled to one license key of Audials One 8. Each participant entitles to one prize only. Winners must also allow his or her email address to be given to the sponsor for product delivery. Contest Closed. Winners are Seb, District and Ant.